Norman Lowell, the leader of the right-wing Imperium Europa was this morning handed down a two-year jail term suspended for four years after being convicted of three charges of racial hatred and one charge of insulting the President of Malta. The cases happened between 2003 and 2006. 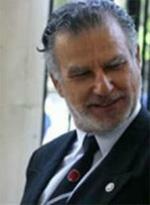 Magistrate Consuelo Scerri-Herrera also fined him €500. Speaking outside the law courts Mr Lowell told reporters and a small crowd that: "this is a sad day, a very sad day for the Maltese. The lights of freedom have been extinguished. We are going back to the medieval ages. The media will be the first victims of the establishment since they have to be extra careful on how they report items." He however also hit out at the media and accused editors of being hypocrites for not offering a single word in his defence. Malta, he said, would be the spark for a new enlightenment in Europe.